Spring PCC act as McDonald’s lead Quantity Surveyor and manage the procurement of the framework contractors and the negotiation of the schedule of rates. 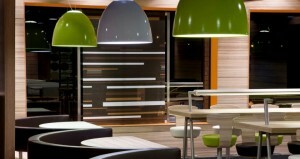 We also manage McDonald’s national construction budget of circa £55M per year. Roll-out projects undertaken are the National reimage programme, double drive-thru programme, manager’s office move programme and restaurant of the future programme. As a result of our continued hard work, Spring PCC have been awarded the ‘Consultant of the Year Award for 2016′ following the same award obtained in 2015. The award recognises an outstanding contribution to the McDonald’s supply chain. Spring PCC has worked with McDonald’s since 2010 in the capacity of Quantity Surveyor and have worked on over 350 individual projects, refitting and remodelling retail units across the country. We were also the lead Quantity Surveyor in the creation of the largest McDonald’s in the world of the Olympic Games in London 2012.